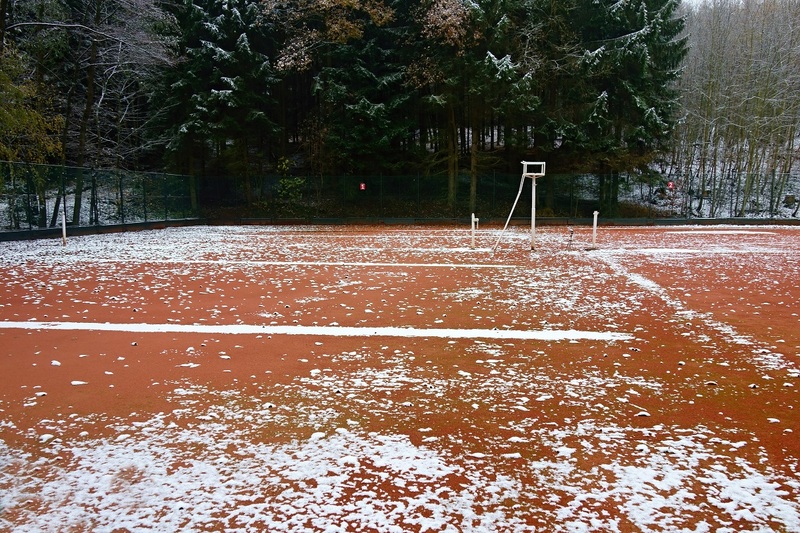 Tennis stars … the cold months are upon us and it is time to make sure our tennis skills don’t go into a deep freeze. I always found cold conditions to be an advantage for me when I walked onto the court. I grew up in a small town in Michigan. With no indoor tennis opportunities near me, most of the calendar year was spent playing tennis outdoors in the cold. It was an advantage against the indoor players that had it nice and cozy. Just a few things made a big difference. Warming up with a jump rope, or a short jog just to warm up the body parts was an advantage. The players used to walking straight onto the court to play usually took a full set to warm up. I had a practice swing routine, from groundstrokes, volleys, overheads and serves. Before I even stepped on the court, I had performed every shot that I was going to do in the match. I would visualize hitting perfect shots and committing to the swing. Have you ever evaluated your warm-up routine? Have you looked at other ways to improve your approach and prepare your body to match your game’s demands? These days I spend a large part of my player development process, at all levels, using a smarter approach towards the player looking to get more performance out of their talent. I have found that the mental and physical warm-up is sometimes non-existent! So when you get a chance, evaluate your process and a new approach may be just what helps you get off to a quicker start in your matches! Now I must address the 2018 U.S Open Women’s Final. I don’t recall the last time such a massive tennis moment turned upside down since John McEnroe played Ilie Nastase in the 1979 U.S. Open. YouTube that match to see it … things did get crazy, and Mac had nothing to do with it! I had one of the best seats in Arthur Ashe Stadium for this memorable final between Serena Williams and Naomi Osaka. I was covering the title match courtside just beneath Serena’s coaching box. My assignment was to provide a sideline perspective to the USTA World Feed that is broadcast to 186 countries that do not have a broadcast crew of their own on-site. I was in the very same position for the two men’s semifinals matches. My perspective was underneath the boxes of Rafael Nadal and Novak Djokovic. As many of you know, the women’s singles final match started to unravel when chair umpire Carlos Ramos gave Serena a warning for her box coaching. At the two men’s semifinals matches I was at, all four players were being coached. I was at the U.S. Open for the entire three weeks, including qualifying matches, and I saw coaching at every match. What I didn’t see was even one warning for coaching from any chair umpire until Serena got her warning. As a former player, there are things that the umpire shouldn’t do. For example, the umpire should not call or overrule the far sideline. The umpire should also not insert themselves into the outcome of a match! The coaching rule is never enforced and why Mr. Ramos decided it was time to pull Serena over and give her a ticket is still confusing to me. Mr. Ramos is a very good umpire. He has always gone by the rulebook, but every umpire should always know the players they are umpiring. You treat all players fairly, but not the same. Serena has a history on that court in big matches. Serena is a very passionate player. I believe each player deserves what I call a “soft warning” in the case of the coaching violation. The second code of conduct when Serena broke her racket at 3-2 up in the second set is an automatic one. The final nail was the final code of conduct warning that ended up in a game for Osaka. Serena should have calmed down. but she never used bad language like she had in a past incident. Was Serena aggressive? Yes! Was it over the line? I didn’t think it deserved a game violation in the finals of the U.S. Open. Both Serena and Ramos have accountability in this match getting out of hand. Osaka played better than Serena on that day and deserved to win, but the match should not have taken that kind of twist of fate. Fun fact … I was once fined $1,000 for calling Doug Flack “Stick Boy” at Wimbledon, and I thought that was uncalled for! Competitive tennis can get the best of all of us. The Serena matches are always “Must-See” because she is so charismatic. It makes the game so interesting when she performs. I have enjoyed hearing so many different takes on that match and because of that, the match will go down as one of the craziest in tennis history! Born in Grayling, Mich., Luke Jensen’s resume includes 10 ATP Tour doubles titles and singles victories against Andre Agassi, Pete Sampras, Ivan Lendl, John McEnroe, Bjorn Borg, Jimmy Connors, Boris Becker, Stefan Edberg and Jim Courier. Jensen and his brother, Murphy, won the 1993 French Open doubles title. He was also a member of the 1991 and 1992 Davis Cup Teams. His ambidextrous play, including his ability to serve the ball with either hand at 130 mph, earned him the nickname “Dual Hand Luke.” Luke is currently director of tennis at Sea Island Tennis Center in Georgia. He may be reached by phone at (315) 403-0752 or e-mail lukejensen84@yahoo.com.